We're only a few minutes' walk to everything Franz Josef has to offer! Go out for dinner or explore the glacier country with a big range of activities close by. Heliservices is an experienced helicopter flight-seeing company providing visitors with a diverse range of South Island scenic helicopter flights, private charters in some of the most spectacular alpine and coastal regions of New Zealand. Boasting an impressive fleet of modern turbine helicopters and with flight offices located in Franz Josef glacier, Fox glacier, Lake Tekapo and Haast, they specialise in year round snow landings, flight-seeing in the Westland National Park. 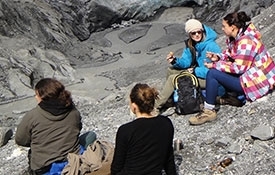 Franz Josef Glacier Guides gives you the opportunity to experience the most spectacular glacier environment available to the general public. They offer a range of glacier hiking tours and experiences that will get you up close to the ice like never before. Their guided tours are tailored to suit visitors of most abilities. The ultimate New Zealand adventure tour is now ready and available for everyone. Skydive Franz is New Zealand's premier skydive company located amidst New Zealand's highest mountains, the ocean, rainforest, glaciers, lakes and rivers. 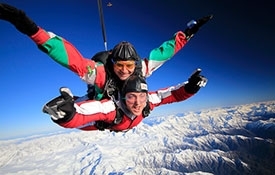 They are the only skydiving operation located in and operating from the region's largest town Franz Josef Glacier. They have a booking office on the main street, and the airport is only five minutes drive from town. Glacier Valley Eco Tours hold a Department of Conservation license to operate guided tours in the South Westland World Heritage area. They provide guests with quality, informative, friendly and relaxed eco-style tours. 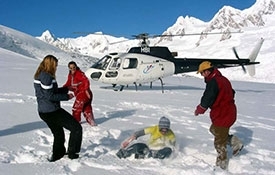 Air Safaris has operated alpine flightseeing throughout the world heritage national parks of Aoraki Mount Cook and Westland Tai Poutini since 1970. The iconic Air Safaris Grand Traverse scenic flight provides the opportunity to view New Zealand's highest peaks and longest glaciers. You can catch the Grand Traverse flight from either of Air Safaris' modern facilities located at Lake Tekapo and Franz Josef.